There’s no rest for the crew of Atlas Tree Service one week after strong winds whipped through San Diego. Their biggest job since the storm is on Saratoga Avenue in Ocean Beach. 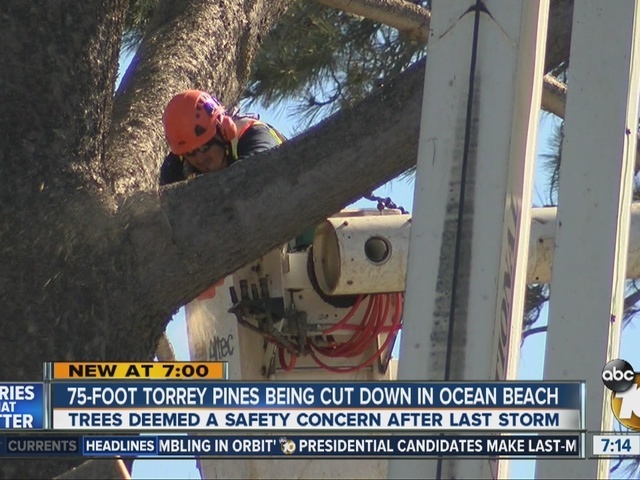 Two 75-foot Torrey pines are now considered a safety risk, according to residents who spoke to 10News. "I had a branch fall on my yard and crush my fence,” said Ocean Beach resident Phillip Gordon. Gordon lives between those two trees, but he once had a Torrey pine in front of his home until it caught a disease and had to be cut down 10 years ago. "I used to put helmets on my kids when they played in the front yard because pine cones would be dropping. I had a windshield taken out in my car,” added Gordon. We've seen even worse in Pacific Beach during last week's windstorm. Local musician Nicki Carano was killed when an eight-foot-wide oak tree landed on her car. And in Mira Mesa, another huge tree fell on top of 10News reporter Marie Coronel and photographer Mike Gold. Both are now recovering from their injuries. People on Saratoga Avenue say that same storm shifted the trees here, lifting the sidewalks. For each tree, the crew has to cut it down branch by branch. Then, it'll cut the trunk, section by section. "It's really quite sad that they're taking it down. This is one of my favorite views. But, if they're a safety hazard, they need to come down,” said resident Kris Schlech. Residents are torn because these trees are rare, but they feel they can be dangerous during windstorms. Torrey pines grow naturally in only two places in the world - Torrey Pines Preserve in La Jolla and Santa Rosa Island off the coast of Santa Barbara. The Torrey pines on Saratoga Avenue were planted here in the 30s. "It's unfortunate, but they're just freakishly big and it's probably time to go before somebody gets hurt,” said Gordon. What took more than 80 years to grow, will be history in three to four days. Torrey pines are considered endangered. 10News is still waiting for the city to confirm why it deemed these trees unsafe. The city has a contract with Atlas Tree Service to trim and cut down trees in San Diego. Atlas says it will take three to four days to remove the trees, then another day to grind the stumps.